The year's biggest eating weekend is over (sigh). 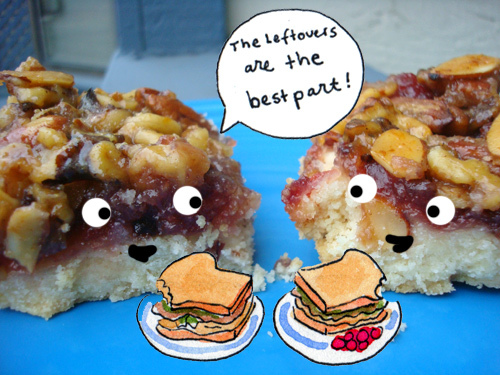 But there's definitely some sweet eating to be had from the little leftovers left, as proven by these cranberry nut squares. 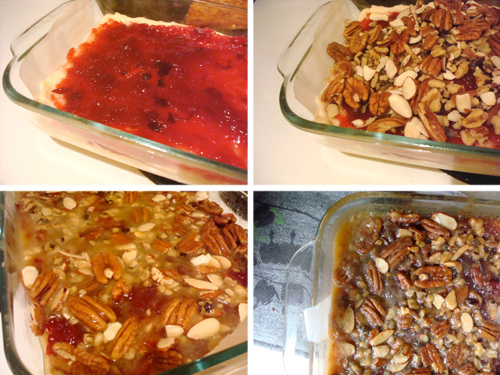 This is a revamped version of a pecan bar but composed instead with leftover cranberry sauce and the mixed nuts that played a supporting role in so many Thanksgiving recipes. The result is surprisingly addictive: sweet, salty, tart, and buttery, all at once. Not only will you enjoy eating them, but you'll also feel a sense of accomplishment at finishing some of the slower-moving Thanksgiving leftovers. You can find the full recipe at Serious Eats!